If you have two Macs—for instance, a desktop and a laptop—you may often find yourself transferring files from one to the other as you prepare to head off to work or school. You may also need to send files to friends or colleagues, and, in some cases, file size could make this difficult. Here are nine ways you can transfer files from one Mac to another. The first, and easiest, way to send files is to use e-mail. This will probably work for the majority of files you need to send to others, and can even work for transferring files to another Mac you own. Just add attachments to e-mail messages and send them. If you have an IMAP account, send a file to yourself, and it’ll show up in your inbox on both of your Macs. Watch out, though; e-mail attachment sizes are usually limited. Many Internet Service Providers (ISPs) limit them to 10MB, though Apple’s MobileMe will accept up to 20MB. On both Macs, open System Preferences, select Sharing, and then enable File Sharing. When you open a Finder window on either Mac, the other should now appear in the Shared section of the Finder sidebar. Click on the computer’s name, enter a user name and password (if you have accounts on both Macs), or connect as a guest. Now you can put files in the Drop Box folder inside a user’s Public folder. There’s no size limit, but for really big files, copy time will depend on how fast your network is. When File Sharing is turned on, you can drop files into a Mac's Public Folder. If you have an AirPort Extreme base station, or Apple’s Time Capsule, you can connect a hard disk to the devices’ USB ports. Set this up as a shared disk in the AirPort Utility (in your /Applications/Utilities folder), and you’ll be able to see it in the Shared section of the Finder sidebar. Copy any files you want to that disk—you may want to make folders for different users, if you have several—and others can get the files whenever they want; their computers don’t have to be on at the same time as they do with file sharing. If you have an AirPort Extreme base station or Time Capsule, you can set it up as a shared disk for easy file transfers. 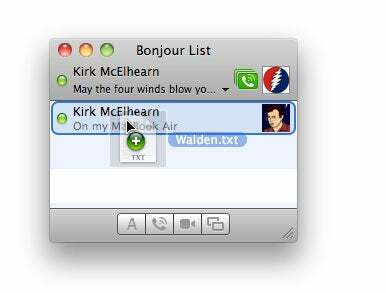 Drag a file onto a person's name in your iChat Buddy List to send a file. If both Macs have Apple’s iChat configured, just find the name of the person in your iChat Buddy List, and drag the file or folder onto his or her name. The person must click to accept the transfer; the files will go right to the other Mac in a jiffy. If you want to send a file to someone in your home or office, and the other user or Mac doesn’t have an iChat account, make sure that Bonjour is enabled in both Macs’ iChat’s Accounts preferences. (Apple's Bonjour system detects users on a local network.) Once it is, display a list of available users by choosing Window -> Bonjour List, and drag a file onto a user’s name. If you often work on two Macs, get a free Dropbox account and sync your Dropbox between those two computers. Put the files you’ll need on the road in your Dropbox folder on your desktop Mac, and you’ll find them in the Dropbox folder on your laptop. In addition, you can access the same files from the Dropbox web site if you need to. 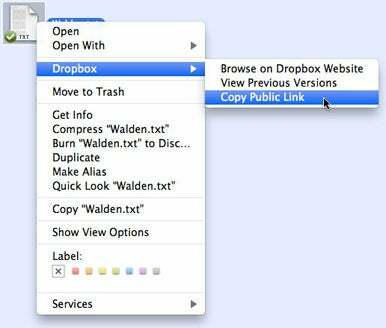 It's easy to use the Dropbox service to transfer a file to a friend or colleague. While Dropbox ( ) makes it easy to sync files across Macs, you can also use this service to send files from one Mac to any other user. Look inside your Dropbox folder and find the Public folder. Put a file in that folder, then right-click (or Control-click) on it and choose Dropbox -> Copy Public Link. Once the file has synced to the Dropbox server, you can send that link to anyone to allow them to download a copy of it. If you have a MobileMe account, you can put files into your iDisk, either from the Finder or via a Web interface. Then, access the iDisk from the Finder -> Go -> iDisk. Choose My iDisk from this menu, if you’re accessing your own iDisk on another Mac, or choose Other User’s Public Folder, if you’re accessing files from another user’s iDisk. Alternatively, you can use the MobileMe Website. Sign in and then add files or find files you’ve already put in your Public folder. Click on a file to select it, and then click on Share File. You can either send an e-mail directly to others, or get a public link that you can send them. You’re limited to 1GB per file, though. Bonus tip If you don’t have MobileMe—or need to send a file that exceeds MobileMe’s limits—you can use other Web services such as YouSendIt. A free YouSendIt account lets you share files of up to 100MB. (Send larger files using a paid account.) You upload the file via the YouSendIt web interface, and then send e-mails with links to users, who can download the files whenever they want. Do you have a lot of files? The old-fashioned method might be best. Burn a CD or DVD with the files and mail them or hand them to the people who need them. In the Finder, choose File -> New Burn Folder. Drag your files into the folder and then click Burn. This isn’t useful if you’re copying files to another Mac you own, but it can be a good way to give a number of people the same files; just burn several copies of the disc. When all else fails, or when you have a huge amount of files to transfer, sneaker-net—using an external hard disk, or a USB thumb drive—may be the best solution. Connect the disk to one Mac, copy the files to it, then unmount it and connect it to the other Mac. If you’re copying, say, tens of gigabytes of music or video files from one Mac to another, this is probably the fastest method. I’ve left out any number of file transfer methods, such as FTP, which requires that you have your own server, and a number of file transfer utilities. I’m sure you have other tricks for file transfers, so feel free to add them in the comments. Senior contributor Kirk McElhearn writes about more than just Macs on his blog Kirkville. Twitter: @mcelhearn Kirk’s latest book is Take Control of iTunes 10: The FAQ.